Connecting kids to lots of interesting experiences has become a lot easier with Skype in the Classroom, a program from the online phone service that connects students with guest speakers and other students around the world. When I arrived at Loyola Elementary School in the Silicon Valley area, I was met by Ellen Kraska, a Technology Integration Specialist who helps teachers in Los Altos bring all sorts of digital projects–movies, digital storytelling, music–into the classroom. 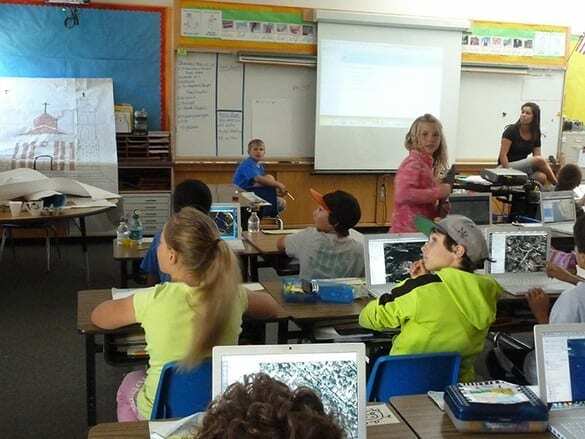 On the day of my visit, Kraska was helping out a 4th grade class with “Mystery Skype”–a game where the students connect via Skype to a mystery classroom somewhere else in the world and use maps and logic to figure out where they are. I sat in the back of the classroom while the kids played with Google Earth (everyone had their own school-provided laptop), snapped photos of the big screen that showed video of the mystery class, and live-blogged their findings into a Google Docs document. The kids pumped their fists as they came closer to pinpointing the mystery classroom (“Do you live in a state that borders a body of water?” “Do you live in a state with lots of stores?”). And after 20 minutes or so, they figured out that the 3rd grade classroom up on the screen was in Miami. As recently as five years ago, you’d be hard-pressed to find an elementary school classroom where kids have constant exposure to nonprofits, NASA engineers, classrooms across the world, and startup founders. As I learned during my visit to Loyola, some of them now do. A little over a year ago, Skype launched its Skype in the Classroom platform, which connects teachers and classrooms with guest speakers, online lessons, and other classrooms. Today, there are 14,000 members and 14 partner organizations, including NASA and Penguin Books. “We’ve seen this underground grassroots movement. We’ve seen people start to use technology [in the classroom], and we realized we should start to kick it into high-gear,” says Tony Bates, the CEO of Skype. November 23, 2018 - The Power of Digital Learning EntrepreneurDigital learning not only educates, but it also enables; and it empowers all the young lives it touches. February 10, 2019 - EduTech - An Answer to Modern Day Education EntrepreneurEdutech is a novel way of helping students attain their dreams and Vedantu is trying to achieve the same.